Those with a stake in the hustling racket of empire have little time for the contrariness that comes with exposing classified information. Those who do are submitted to a strict liability regime of assessment and punishment: you had the information (lawfully obtained or otherwise) but you released it for public deliberation. Ignorance remains a desensitising shield, keeping the citizenry in permanent darkness. Critics indifferent to the plight of Julian Assange have seen his concerns for prosecution at the hands of US authorities as the disturbed meditations of a sexualised fantasist. He should have surrendered to the British authorities and, in turn, to the Swedish authorities. It was either insignificant or irrelevant that a Grand Jury had been convened to sniff around the activities of WikiLeaks to identify what, exactly, could be used against the organisation and its founder. Whether it was the Central Intelligence Agency, the US Department of Justice, or the specific army of investigators assembled by special counsel Robert Mueller III to weasel out material on the Trump-Russia connection, Assange remains a substantial figure who needs to be captured, sealed and disappeared. Forget any such references to journalism and being a truth teller with obsessive tendencies; for these officials, Assange had become a calculating machine in the information market, a broker in state details and activities, trading and according value to subject matters of his choice. Dwyer, whose remit also includes investigating WikiLeaks, had bungled. What is not known is the nature of the charges and what events they might cover. Do they date back to the days of Cablegate or feature updates with the Vault 7 revelations showing the range of cyber tools deployed by the CIA to penetrate mobile devices and computers? Or do they feature the trove of hacked Democratic emails which constitute a feature of the Mueller investigation? Charges might well centre on using 18 USC §641, which makes it unlawful for a person to receive any record or thing of value of the United States with intent to convert it to his use or gain, knowing that it was stolen. But even there, the issue of press protections would apply. Prosecutors have previously flirted with conspiracy, theft of government authority and purported violations of the Espionage Act, but the Obama administration, for all its enthusiasm in nabbing Assange kept coming up against that irritating bulwark of liberty, some would say impediment, known as the First Amendment. 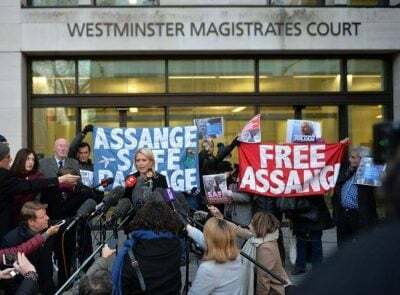 Prosecute Assange, and you would be effectively prosecuting the battlers of the Fourth Estate, however withered they might be. A niggling concern here lies in Justice Department regulations, as amended by Eric Holder in 2015, which cover the obtaining of information and records from, making arrests of, and bringing charges against members of the press. As Susan Hennessey, Quinta Jurecic, Matthew Kahn and Benjamin Wittes point out in Lawfare, one exception stands out with sore attention: “The protections of the policy do not extent to any individual or entity where there are reasonable grounds to believe that the individual entity is … [a] foreign power or an agent of a foreign power”, so defined in the Foreign Intelligence Surveillance Act. The mania in packaging, ribbon and all, of Assange with those in the Kremlin becomes clear. To make him a foreign threat takes him outside the scope of press protection, at least when it comes to those desperately drafted regulations. Since US voters cannot be trusted by the country’s corporate owners and the parties of business to act with any degree of maturity and intelligence, it has been assumed by the political classes that they must have been swayed and manipulated by a foreign power. Or fake news. Or news. That assessment obviates any issue as to whether the Clinton machinery within the Democratic Party did its fair share of manipulation and swaying – but then again, quibbles can’t be had, nor hairs split on this point. Keeping it local, and attacking the Great Bear fused with Satan that is Russia, frosted with new Cold War credentials, remains the low-grade, convenient alibi to justify why the backed horse did not make it to the finishing line. To Assange would be small though consoling compensation.